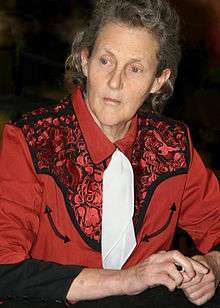 Dr. Grandin has become a prominent author and speaker on the subject of autism because “I have read enough to know that there are still many parents, and yes, professionals too, who believe that ‘once autistic, always autistic.’ This dictum has meant sad and sorry lives for many children diagnosed, as I was in early life, as autistic. To these people, it is incomprehensible that the characteristics of autism can be modified and controlled. However, I feel strongly that I am living proof that they can.” (from Emergence: Labeled Autistic). Every autistic child or adult is different. A sound or sight, which is painful to one autistic child, may be attractive to another. The flicker of fluorescent lighting can be seen by some children with autism and may be distracting to them. It is mostly likely to cause sensory overload in children who flick their fingers in front of their eyes. Replacing fluorescents with incandescent bulbs will be helpful for some children. Many children with autism are scared of the public address system, the school bells or the fire alarms, because the sound hurts their ears. Screeching electronic feedback from public address systems or the sound of fire alarms are the worst sounds because the onset of the sound canNOT be predicted. Children with milder hearing sensitivity can sometimes learn to tolerate hurtful sounds when they know when they will occur. However, they may NEVER learn to tolerate UNexpected loud noise. Autistic children with severe hearing sensitivity should be removed from the classroom prior to a fire drill. The fear of a hurtful sound may make an autistic child fearful of a certain classroom. He may become afraid to go into the room because he fears that the fire alarm or the public address systems may make a hurtful sound. If possible, the buzzes or bell should be modified to reduce the sound. Sometimes only a slight reduction in sound is required to make a buzzer or bell tolerable. Duct tape can be applied to bells to soften the sounds. If the public address system has frequent feedback problems, it should be disconnected.Echoes and noise can be reduced by installing carpeting — carpet remnants can sometimes be obtained from a carpet store at a low cost. Scraping of chair legs on the floor can be muffled by placing cut tennis balls on the chair legs. Certain foods may be avoided due to sensory over sensitivity. Crunchy foods such as potato chips may be too loud and sound like a raging forest fire to children with over sensitive hearing. Certain odors may be overpowering. When I was a child I gagged when I had to eat slimy foods like jello. However, some limited food preferences may be bad habits and are not due to sensory problems. One has to be a careful observer to figure out which foods cause sensory pain. For example, if a child has extreme sound sensitivity, he should not be required to eat loud, crunchy foods; but he should be encouraged to eat a variety of softer foods. When I was a child my parents made me eat everything except the two things which really made me gag. They were under-cooked slimy egg whites and jello. I was allowed to have a grilled cheese sandwich everyday for lunch, but at dinnertime I was expected to eat everything that was not slimy.To motivate a child to eat something he does not like, it is recommended to have a food he really likes such as pizza right in front of him along with the food he dislikes. He is then told that he can have the pizza after he eats a few bites of peas. It is important to have the pizza right there in front of him to motivate eating something he does not like. Repeating back what has been said, or being able to sing an entire TV commercial or children’s video is called ‘echolalia.’ Echolalia is actually a good sign because it indicates that the child’s brain is processing language even though he may not be understanding the meaning of the words. These children need to learn that words are used for communication. If a child says the word ‘apple,’ immediately give him an apple. This will enable the child to associate the word ‘apple’ with getting a real apple. Some autistic children use phrases from TV commercials or children’s videos in an appropriate manner in other situations. This is how they learn language. For example, if a child says part of a breakfast cereal slogan at breakfast, give him the cereal.Autistic children also use echolalia to verify what has been said. Some children have difficulty hearing hard consonant sounds such as “d” in dog or “b” in boy. Repeating the phrase helps them to hear it. Children who pass a pure tone hearing test can still have difficulty hearing complex speech sounds. Children with this difficulty may learn to read and speak by using flash cards that have both a printed word and a picture of an object. By using these cards they learn to associate the spoken word with the printed word and a picture. My speech therapist helped me to learn to hear speech by lengthening hard consonant sounds. She would hold up a ball and say “bbbb all.” The hard consonant sound of “b” was lengthened. Some autistic children learn vowel sounds more easily than consonants. Fixations should be used to motivate schoolwork and education. If a child is fixated on trains, use his interest in trains to motivate reading or learning arithmetic. Have him read about trains or do arithmetic problems with trains. The intense interest in trains can be used to motivate reading. It is a mistake to take fixations away, but the child needs to learn that there are some situations when talking about trains is not appropriate.The idea is to broaden the fixation into a less fixated educational or social activity. If a child likes to spin a penny then start playing a game with the child where you and the child take turns playing with the penny. This also helps to teach turn taking. A train fixation could be broadened in studying history. A high-functioning child would be motivated to read a book about the history of the railroad. One should build and broaden fixation into useful activities. My career in livestock equipment design started as a fixation on cattle chutes. My high school science teacher encouraged me to study science to learn more about my fixation. What is the difference between PDD and autism? Autism and PDD are behavioral diagnoses. At the present time there are no medical tests for autism. Autism is diagnosed based on the child’s behavior. Both children diagnosed with autism and PDD will benefit from education programs designed for autistics. It is essential that children diagnosed as PDD receive the same education as children diagnosed with autism. Both autistic and PDD children should be placed into a good early education program immediately after diagnosis. Children diagnosed with PDD tend to fall into two groups: (1) very mild autistic symptoms, or (2) some autistic symptoms in a child who has other severe neurological problems. Therefore, some children diagnosed as PDD may be almost normal; and others have severe neurological problems such as epilepsy, microencephaly or cerebral palsy. The problem with the autism and PDD diagnoses is that they are NOT precise. They are based only on behavior. In the future, brain scans will be used for precise diagnosis. Today there is no brain scan that can be used for diagnosing PDD nor autism. Stiff scratching clothes or wool against my skin is sandpaper ripping off raw nerve endings. I am not able to tolerate scratching clothes. Autistic children will be most comfortable with soft cotton against their skin. New underwear and shirts will be more comfortable if they are washed several times. It is often best to avoid spray starch or fabric softeners that are placed in the dryer. Some children are allergic to them. [Note: Caretakers and teachers should also avoid the use of perfume because some children hate the smell and/or they are allergic to it. ]Even today at the age of 49, I have had to find good clothes and work clothes that feel the same. It takes me up to two weeks to habituate to the feeling of wearing a skirt. If I wear shorts during the summer, it takes at least a week before long pants become fully tolerable. The problem is switching back-and-forth. Switching back-and-forth can be made more tolerable by wearing tights with skirts. The tights make the skirt feel the same as long pants.